BMWs Draeger says the automaker has delivered 1.1 million cars equipped with EffficientDynamics features such as stop-start. DETROIT -- BMWs decision three years ago to make its EfficientDynamics fuel-saving technologies standard on most models has done more than just lower fleetwide CO2 emissions. 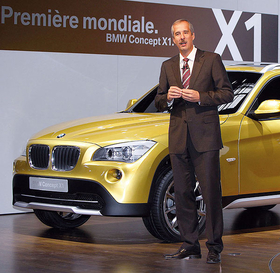 Klaus Draeger, the carmakers head of r&d, said EfficientDynamics has made used BMWs more attractive to car buyers. We now have 2-year-old cars with EfficientDynamics and these cars have more stable residual values, he said. In an interview at the auto show here, Draeger said that just in the past year, the EfficientDynamics strategy has helped BMW reduce fleetwide CO2 emissions to 158 grams per kilometer from 187g/km a year earlier. He said that 29g/km cut would not have been achieved if EfficientDynamics technology had been optional. BMW has delivered 1.1 million cars equipped with EffficientDynamics features. These include stop-start technology, brake-energy regeneration and other fuel-saving innovations. Draeger said the cut in CO2 emissions has been particularly important in countries such as France, Portugal and Ireland, where car taxes are partly based on those emissions. In those countries, we are becoming extremely successful, he said. Draeger said that, despite cost pressures, BMW is maintaining its r&d focus on environmental technology. Said Draeger: You need cars that fascinate people but at the same time are highly efficient."